Green Lanterns, The Illusive Man And The Best Week Of Comics On The iPad... Ever? 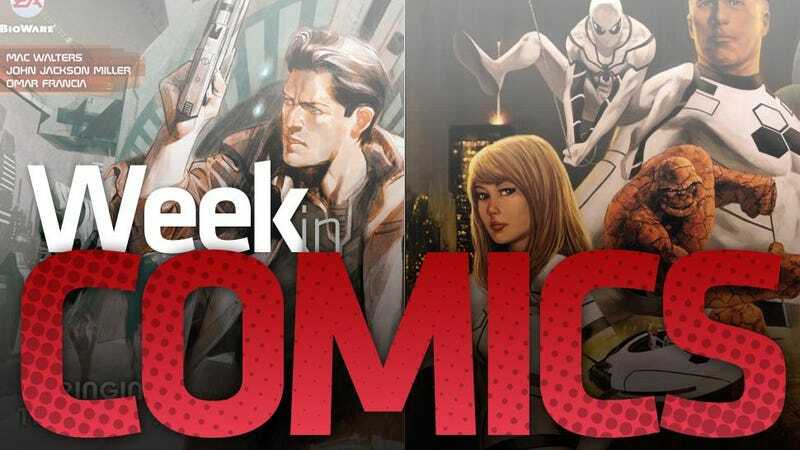 The selection of video game comics this week is thin, but a couple of major stories launch in the world of super-hero comics, one of the best graphic novelists in the world releases his first book in over a decade, and the iPad gets probably its best release of recent classics ever. This is a good comics week! FF #1 It's the Fantastic Four - The (dead) Human Torch + Spider-Man + costumes that remind me of the great, hated video game P.N. 03. Green Lantern #64 A couple of years ago, the Green Lanterns fought the Yellow Lanterns. That made for a pretty cool super-hero brawl. Then, the Green Lanterns fought the Red Lanterns, the Purple ones, the Blue ones, the Orange one, and then the Black ones. Apparently the way you top this is by having Greens fight Greens. Seems anticlimactic to me, but writer Geoff Johns' Green Lantern comics have been syrupy sci-fi fun so far. Ultimate Comics Spider-Man #156 They're starting to kill Spider-Man in this issue, I believe. Surely, that's why it's called "Death of Spider-Man, chapter 1" and promising "the most shocking Spider-Man story you will ever read." How shocking can it be if they gave away who dies? The creative team on this, Brian Michael Bendis and Mark Bagley, can write great Spider-Man comics. Cross your fingers about this one. Cardboard Valise It's by Ben Katchor. We're getting a new book by Ben Katchor! Words can hardly convey what excellent news this is. His "The Jew Of New York" and "Julius Knipl, Real Estate Photographer" are among the most lovely, understated, and smart graphic novels I've read. Putting Katchor here among Green Lantern and video game comics is a bit odd, but trust me. Official summary: "Emile Delilah is a young xenophile (lover of foreign nations) so addicted to traveling to the exotic regions of Outer Canthus that the government pays him a monthly stipend just so he can continue his visits. Living in the same tenement as Emile are Boreal Rince, the exiled king of Outer Canthus, and Elijah Salamis, a supranationalist determined to erase the cultural and geographic boundaries that separate the citizens of the Earth. Although they rarely meet, their lives intertwine through the elaborate fictions they construct and inhabit: a vast panorama of humane hamburger stands, exquisitely ethereal ethnic restaurants, ancient restroom ruins, and wild tracts of land that fit neatly next to high-rise hotels." Infamous #2 Official summary: "Shadowy FBI agent Moya Jones has ordered Cole MacGrath captured, no matter the cost! As soldiers flood the streets of Empire City - and Cole struggles to protect the city's citizens - an unspeakable horror rises from the depths of an old First Sons' lab." Mass Effect #3 Official summary: "The Illusive Man finds himself far from home in an alien galaxy. As his eyes open to the secrets of the universe, the Illusive Man comes ever closer to his destiny as galactic power broker in this riveting science-fiction adventure!" I've been looking at the weekly comics releases on the iPad for a few months and this week's update is easily the most impressive. The Comixology Comics app is stuffed with excellent releases. Where to start? Superman: Red Son is a highly-regarded three-issue speculation by writer Mark Millar of what would have happened if Superman's rocket had landed in Russia instead of Kansas. We3 is an even more highly-regarded three-issue series by writer Grant Morrison and artist Frank Quitely — the best writer/artist duo in the last decade, I'd argue — all about the escape of three household pets that the U.S. government had tried to turn into weapons of war. The best writer-artist team I'd put up against Morrison and Quitely are Matt Fracion, Fabio Moon and Gabriel Ba. Good thing the first four issues of their excellently warped secret-agent adventure Casanova debut on the iPad this week as well, listed as two issues Casanova Luxuria #1 and #2 that compile the first four comics in their run. But weren't' Ed Brubaker and Darwyn Cooke's Catwoman comics some of the best-constructed super-hero comics of the last 10 or so years, you might ask? They were, and nine issues of that run also debut on the iPad this week. There are lots of other great comics, most of them a few years old, also launching digitally this week in that Comics store. It's an extraordinary offering.